Activities Things to do, places to go. History About us. How we became what we are. 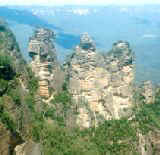 Images Come & See the Blue Mountains! Railways Take a journey over the Blue Mountains. Tourists What you need to know for your visit. The only World Heritage region on the edge of a major city (Sydney). Arthur Stace's one-word graffiti sermon closes Sydney's Millennium fireworks spectacular. Copyright � 1996-2003, David JW Martin, except where other copyright applies. All rights reserved. Revised: June 28, 2006 .